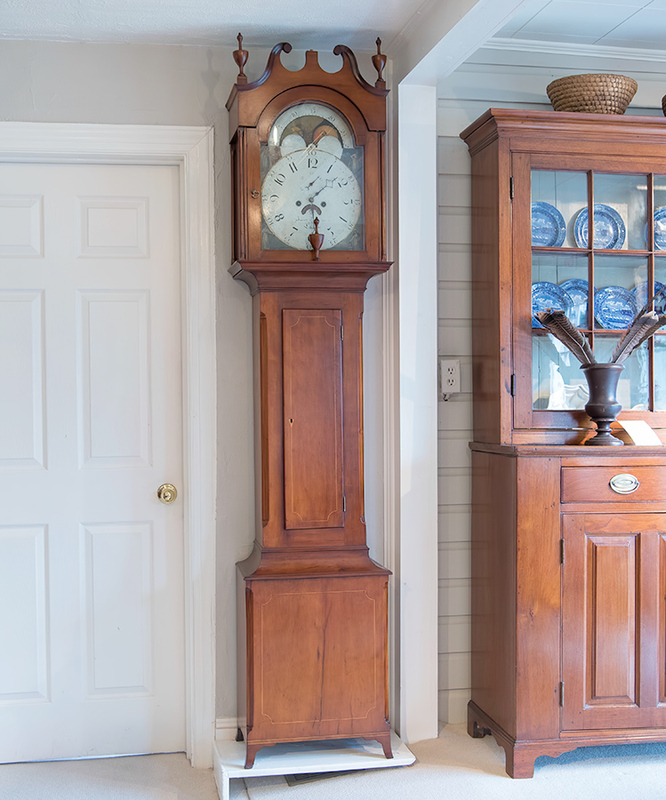 Chippendale Apple Wood Tall Case Clock. The Broken Arch Bonnet With The Original Flame Carved Finials Above A Tombstone Shaped Door. Opening To Reveal A White Painted Face Signed, Solomon Parke, Philadelphia, With Roman Numerals And A Moon Phase Flanked By Colonetes. The Tombstone Shaped Waist Door, Flanked By Fluted Corner Columns. The Molded Base, With Applied Moldings. 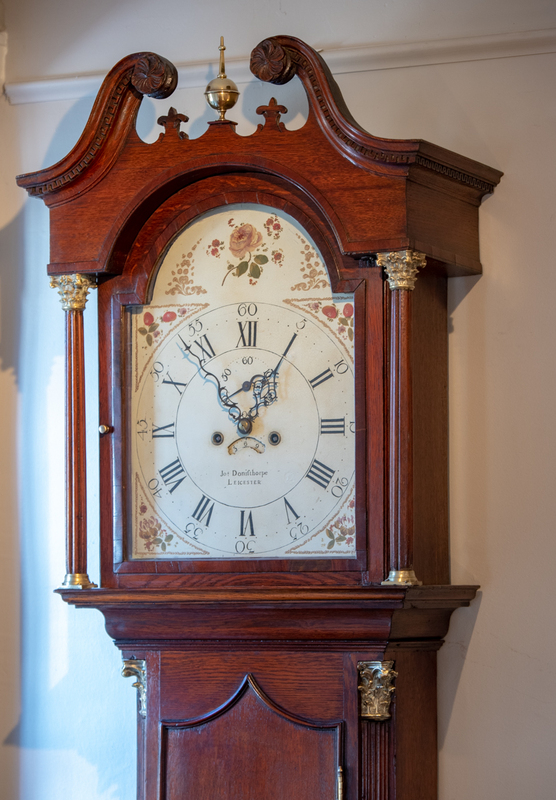 Raised On Replaced Ogee Bracket Feet, Copied From An Original Solomon Parke Case A Fine Example! 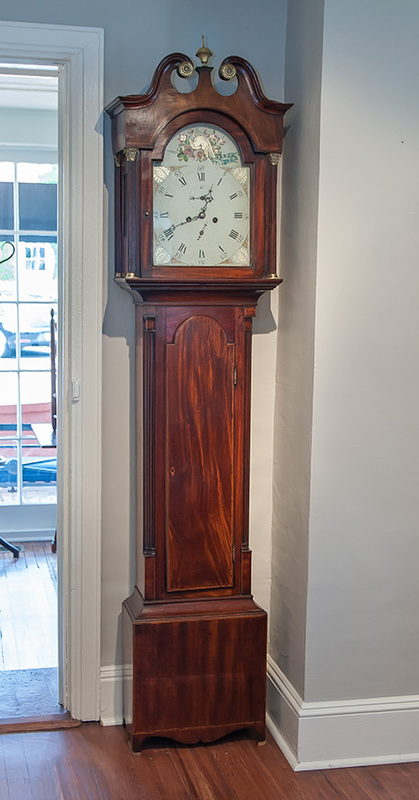 Height 94 1/2"
George III, Figured Mahogany Tall Case Clock The Shaped Pagoda Bonnet Having A Fret-Work Bell Screen, Flanked By Brass Finials Above A Glazed Arched Door, Depicting A Silver And Brass Face, Signed George Clerke, London And Painted Moon Phase, Second Hand And Calendar Date, Flankey By Brass Inlaid, Stop Fluted Columns. The Waist With A Shaped And Molded Long Door, Flanked By Similar Columns, Above A Molded Base And Raised On A Cut-Out Stepped Plinth. 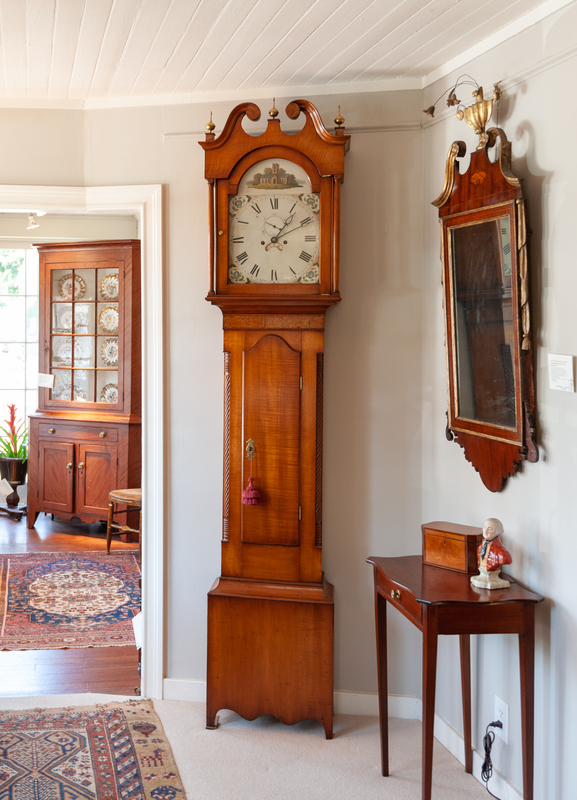 H. 94"
George III Mahogany Tall Case Clock With Scrolled Bonnet With Brass Rosettes Above An Square Glazed Door & Inlaid Arch Waist Door Flanked By Fluted Corner Columns. 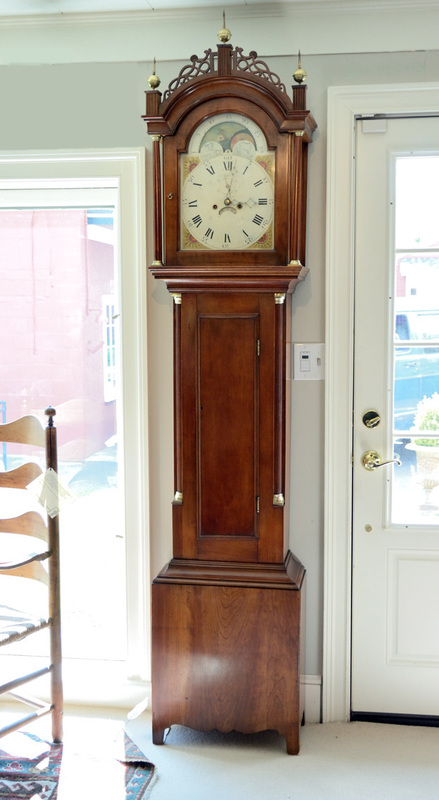 Federal Cherry Tall Case Clock with 8 Day Brass Movements Recently Serviced & Repaired. Noteworthy Fine Portions & Patina. H. 91 1/2” To Finial. New England, Circa 1810.